What Are We Doing To The Biosphere? There have been many worried papers and articles on tropical rainforest destruction (including by this author), and this destruction’s effect on CO2 sequestration. There are countervailing forces in play, however. Tropical forests cut for “slash and burn” farming are typically allowed to return to the forest state as the soil is depleted after a few years of harvesting crops, unless the ground is reserved for permanent pasture. The crops themselves replace part of the biosphere. In temperate forests, clear-cuts are replanted. Forest regeneration typically takes from 40 to over a hundred years, but the average is probably about 80 years. An evergreen forest destroyed by forest fire that I helped replant as a Boy Scout 60 years ago was recently harvested and replanted again. Another plot in the same area that was clear-cut 90 years ago, was naturally re-seeded and harvested again three years ago. Most of that carbon was sequestered into homes. CO2 fertilization improves biosphere growth. Present CO2 levels are more than 100 ppm over pre-industrial levels, and are allowing about 15% increased primary biosphere production. The problem is that both forest destruction and CO2 fertilization are not known very accurately for the biome as a whole. The guesses in the literature range from 1.5 Gigatons to 4 Gigatons carbon annually released to the atmosphere from forest destruction, and 10 to 20% CO2 fertilization. In the following figures, 2 Gigatons forest destruction to date and 1 Gigaton future destruction have been used, and 15% CO2 fertilization for 100 ppm CO2 increase. Figure 1 is a plot of total biosphere assuming 2 Gigatons forest annually burned to date and 1 Gigaton burned annually in the future, along with 15% fertilization for each 100 ppm CO2 increase, plus a 1.25% annual regrowth of tropical forests. 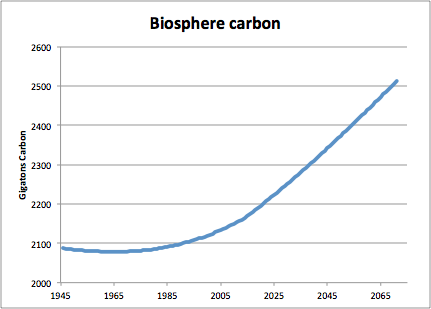 The result is a declining biosphere where destruction exceeds growth until about 1966. But then there is an increasing growth rate since as the CO2 level increases, where growth exceeds destruction. The amount of carbon taken up by the oceans is another factor that is not known very accurately. The current “consensus” guess is that the ocean takes up half of the carbon that is emitted by man’s activities. Here is my attempt to chart land and ocean CO2 flux over time from 1946 to the present and projecting into the future to 2075. The resulting atmospheric CO2 is also plotted. The historical fossil carbon emissions are plotted, with a future increase to 10 Gigatons annually. The land numbers are based on the data used in notrickszone.com/ and the above 15% figure for CO2 fertilization. The ocean CO2 uptake numbers are based on this paper and are linearly projected into the future. 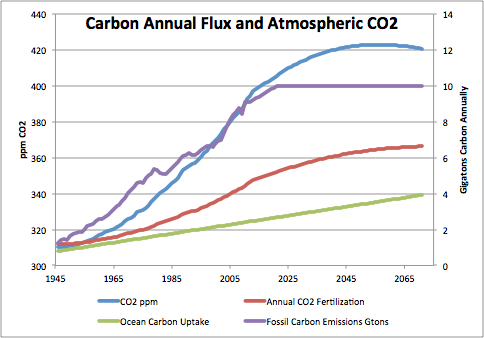 Figure 2 is a plot of CO2 (blue curve, left scale), biosphere carbon uptake with CO2 fertilization (red curve, right scale), and ocean carbon uptake (green line, right scale). If the world holds fossil carbon emissions to less than 10 Gigatons per year, CO2 should never exceed 430 ppm, and will begin falling after mid-century. If we put modest effort into tropical forest preservation, and replanting temperate forests, along with other biome improvements, we might stop the increase at an even lower figure. We don’t need to reduce carbon emissions. We will never see CO2 doubling. No one has projected the impact of CO2 biosphere fertilization on the CO2 increase in the atmosphere. NASA has projected that CO2 will be 550 to 800 ppm by the end of the century. This could only be true if the biosphere is severely damaged by forest destruction. Hi Ed, interesting article. In it you quote the following, “The current “consensus” guess is that the ocean takes up half of the carbon that is emitted by man’s activities”. I wonder about the accuracy of that ‘consensus’ view. I’ve heard it said elsewehere that there is about 50 times more co2 in the oceans than in the atmosphere, and this is regulated by Henry’s law of partial pressures. If this ratio remains reasonably constant as co2 concentration increases, which I believe it would or should, then wouldn’t the oceans absorb more like 98% of man’s co2 emissions. Of course presuming constant temperature and pressure. indicating that the ocean is a small CO2 source (with large regional variation), but that marine life may (net) consume all our emissions. Please ignore Henry’s-law arguments, as (I think) the atmosphere is tail to the ocean’s dog. Seawater contains ~120x air concentration of CO2, as calcium bicarbonate (normal temporary “hardness”). Seashell construction (eg diatoms) must release half of this (60x) as gas. The air/sea system is probably dominated by biochemistry. This means that a ~½% change in this chemistry could double or negate the recent atmospheric CO2 increase. I’ve yet to see data that rules this out. While CO2 appears a limiting nutrient for terrestrial vegetation, it probably isn’t for marine life, so I’m unsure whether the ocean absorption trend in Fig 2 will persist. This is the first of several articles. We will get there. Does anybody out there know of any research carried out to ascertain atmospheric CO2 levels in the MWP ? If, as I suspect, levels were higher than at the end of the LIA, shouldn’t we be describing a recovery in CO2 levels due to natural variation rather than reinforcing the warmist message of CO2 rise being the fault of Mankind? CO2 diffuses in ice and the CO2 peaks are reduced. If taken as measured, the ice core data shows a modest rise during the MWP, but it must have been much higher. Here is a “peer-reviewed”article along the same lines.